She’s funny, brash, outlandish, scandalous, “plastic” and downright rude! 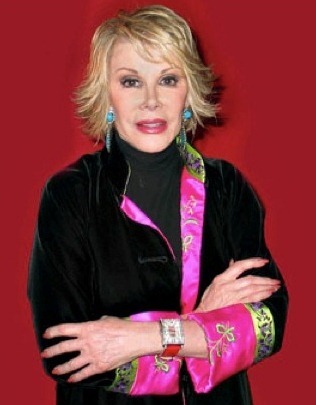 Call her what you want but Joan Rivers is at 79, still a major celebrity. Born Joan Alexandra Molinsky and raised in Brooklyn New York, she found fame in mocking the absurdities of her own life as well as Hollywood’s most celebrated tabloid newsmakers. After graduating from Barnard College in 1954 with a BA in both English Literature and Anthropology, she hopped from job to job trying to find her niche. She worked as a Tour Guide at Rockefeller Center, a proofreader and as a fashion consultant. It was agent Tony Rivers that suggested she adopt a new last name to support her desire for a career in acting. She began her career in New York Theater during the late 1950’s and transitioned into television during the early 1960’s. She made her first television appearance on The Tonight Show, when Jack Paar hosted the program. Soon after, Johnny Carson replaced Mr. Paar and made Joan the first sole guest of the show. It proved to be the propulsion that would take her career to the next level. She would later go on to host her own talk shows; The Late Show Starring Joan Rivers and The Joan Rivers Show for which she won her first Emmy, in 1989. In addition to being one of the worlds most famous comedians, Joan Rivers is a also a woman of fabulous style, so much so that she is regularly found on “Best Dressed” lists from around the world. From 1996 thru 2007 she found herself putting those fashion skills to good use. She hosted, alongside her daughter Melissa, the “Red Carpet” pre-award shows for E!, and was a reporter of celebrity fashion for TV Guide. Those who fell into Joan’s good graces were richly rewarded with accolades and those who did not became the fodder for scathing satirical criticism. It was during this period that Joan was introduced to Gevril by their V.P. of Public Relations, Steven Jay. As Steven explains; “Joan was looking for an oversized watch with a lot of ‘bling’ to wear for reporting from the Oscars ‘Red Carpet’. When she got a look at the ‘Avenue of Americas Glamour’ with its 44mm rectangular case, red mother of pearl dial and 2.25 carats of diamonds, she knew it was exactly what she was looking for.” She loved the timepiece so much; she not only wore it on the “Red Carpet”, but on her post Oscars show, The Fashion Police, and continues to regularly wear it at the many prestigious social gatherings she attends.